Shopping for Star Wars Watches? 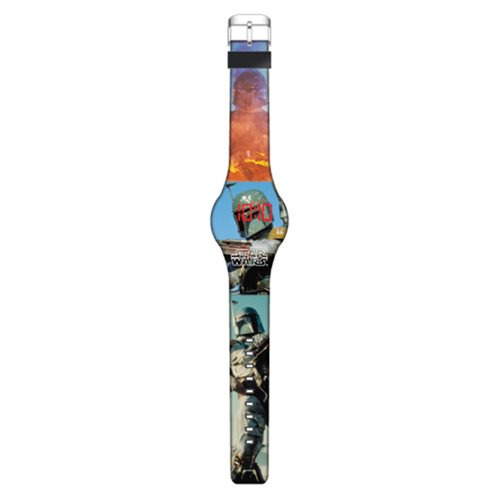 Pay homage to the one of the most feared bounty hunters in the Star Wars galaxy with this Star Wars Boba Fett Action Image LED Watch. The LED watch features 3 images of Boba Fett as seen in the Star Wars movies. At first glance, this watch resembles a sleek silicone wristband, but with a simple push of a hidden button on the face of the watch, a red LED time lights up to display the time! Total length of the watch measures about 9 1/2-inches long including face. The watch comes packaged on a firm cardboard backing. Ages 13 and up.